Cigna Global long term medical insurance is top of the line in international health and travel insurance, innovation, and is tailored to fit your specific needs as you spend time traveling and residing abroad. This is a plan designed to cover you for a long time, such as when you reside in a country as an expatriate. This is amazing health insurance overseas for growing families, international workers, volunteers, and missionaries; those who work with NGOs, Nonprofits, humanitarian, relief and development, churches, and faith based organizations. The reason that this coverage is so incredible is because you can choose whether to include almost every type of coverage on your plan. There is such freedom in customizing your plan for your essential international medical protection! Before we get into the customization, the Cigna Global health insurance overseas has three foundational levels of coverage: Silver, Gold, and Platinum. The base coverage is called the core. Core benefits: The core is the coverage the plan has “as is”, or without anything else added to it. All of the plans have standard medical benefits to cover hospitalizations, inpatient psychiatric care, cancer, and distinctively, newborn care as well! Maternity benefits are included with the Gold and Platinum plans. There are two areas of coverage for this international health insurance, to include U.S. coverage, or excluding U.S. coverage. When you include U.S. coverage, you have up to three months you can be covered in the U.S. per year. Cigna Global has one of the best worldwide networks which give you the benefits of accurate medical provider information, recommendations, and access to excellent medical centers and specialists. Optional modules for customization: There is more fun to be had now that you know about the basic core coverage! We can now move on to the optional modules. On each level of coverage you can actually add a portion of additional benefits. This is an exclusive reason that the Cigna international health and travel insurance is of the very best worldwide protection. One of these modules, for example, is the U.S. coverage because it is optional. Let me get the information for you! International Outpatient: This module is for expenses from lab work, doctors visits, prescriptions, physical therapy, immunizations, as well as annual routine for children and well child tests. The higher the level of coverage, the lower the caps are on some benefits. International Medical Evacuation: This coverage is highly recommended for any type of international travel. International medical evacuation insurance is designed to provide transportation to the nearest adequate medical facility for necessary treatment. This is if there is no local treatment available for the immediate medical necessity. Adding this module will provide you with not only international medical evacuation insurance, but also repatriation of mortal remains, compassionate visit, and more. All of the benefits are the same for every level of coverage. Even though great hospitals may be in your destination, they may not be able to handle every type of medical condition. We never want any individual, or their families, to be stuck with a medical evacuation bill! Please be sure to contact the insurance company in this event so that they can arrange and pay for the evacuation. International Health and Wellbeing: This is a wonderful addition to support overall health and wellbeing! It is a rich resource that gives you access for health screenings and check-ups, physical exams, counseling, dietetic consultations, and online education and programs. All of this can be included to help you get the most out of your health insurance overseas. International Vision and Dental: General coverage for tests, preventative care, and some coverage for treatment and materials relating to Dental and Vision. Various waiting periods apply for specific provisions. U.S. Coverage: Having U.S. coverage is very important for those with travels to the U.S.A., and for U.S. citizens. Coverage up to three months per year is available on the Cigna Global international health and travel insurance. Even if a U.S. citizen doesn’t plan to come back to the U.S., if a serious medical condition occurs, they sometimes go back to the U.S. for care. Citizens of other countries traveling outside the U.S. will save money by not selecting this module. Maternity: Maternity benefits are not available on the Silver plan, but are included on the Gold and Platinum. It is great to think about maternity coverage if you may have a child in the future. There is a ten month waiting period before maternity benefits are available. The Gold plan provides up to $7,000 and the Platinum plan provides up to $14,000 for childbirth, inpatient and outpatient treatment, and obstetricians’ and midwives’ fees. Complications from maternity are also covered at $14,000 on the Gold and $28,000 on Platinum. Overall the Cigna international health insurance is amazing for international protection! Many have used this as their health insurance overseas, as missionary insurance, and for maternity benefits as they build a bigger family. We are happy to recommend excellent coverage from an outstanding international insurance company. 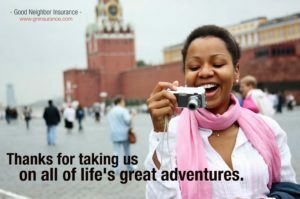 Good Neighbor Insurance provides international travel insurance to those traveling outside their country of resident/country of citizenship. Call one of our professional international travel insurance agents at 866-636-9100 or you may email us at info@gninsurance.com. Have an amazing and safe travels! Should you renew your U.S. passport now or wait for the new U.S. passport design?